eMarketer is out with some great data on small business search ad spending thanks to a new report by WebVisible, a local online advertising software company. Small businesses have increased spending 159% year over year (Q2 2009 vs Q2 2010). If this spending doesn't indicate optimism about the economy, I don't know what does. That, or business owners know when things get tough the last thing you should slash is your marketing efforts - otherwise you only hurt your bottom line more. Another intriguing data point from the report: small businesses are spending less on Google and Yahoo! and more on Ask.com, while holding steady at Bing. Are CPCs getting too high over at Google and Yahoo for small businesses? Inquiring minds would like to know. This could represent the beginning of a trend that doesn't bode well for the search giants. Small businesses are probably increasing their spending because they're seeing more bang for their buck. Website conversions are up 8% just since Q1 of this year. Year over year they're up more than 12%! Clicks on search ads that lead to calls are also up almost 75% year over year. Are small business owners getting more savvy about search advertising, too? The report found the average campaign now bids on 75 keywords, up from 54 in the same period last year. I wonder if these businesses are figuring out the conversion power of long-tail keywords. These findings are very telling about the state of search advertising, and the economy overall. Read more of the report's findings on eMarketer. Have you seen Google's Wonder Wheel? You'll see it as an option on the left side column adjacent to any search result. This nifty little SEO, and I think SEM, map tool allows you to see related search terms that people are actually using. While not data heavy, it does provide a glimpse into optimizing your content for a keyword family. While the SEO implications are obvious, I think this also has applications in SEM. In any case, it is a very visual way to organize the keywords you need to be using on your website, I recommend you check it out. If you want to learn how to find and use the Google Wonder Wheel, check out this video I found. At Root Orange we are adamant believers that we only succeed if we help our clients succeed. To that end, we put our generic domains to the SEM test: can generic domain names lower search engine marketing cost-per-click? We partnered with a lawyer we contacted out of the blue Randi Vladimer, who runs a divorce and family law practice in the Main Line suburbs of Philadelphia. She let us run SEM campaigns, on our dime, to see if generic domains worked to lower CPC costs for your typical small business. In order to test the efficacy of the generic domain, we ran one Google AdWords campaign using her website's domain, and another campaign using the generic domain "DivorceLawyer.com". Aside from the domain, we held every other variable constant in both campaigns: keywords, ad copy, bid price, and budget. The results were astounding. The generic display domain lowered CPC by 21% and increased CTR by 400%. Our study replicated the results found by a 2009 British study, providing further confirmation that generic display URLs confer a competitive advantage to users in SEM campaigns. We will release the full case study online in the coming weeks. Over the last several months we have learned a great deal about the legal regulations that surround advertising online, especially in the legal arena. It is surprising that field of law is so heavily regulated when it comes to advertising. After all, just about any service provider can scam an unsuspecting individual, so why are lawyers targeted for such tough regulation? Even more frustrating for lawyers is that regulations vary from state to state. So if you're admitted to the bar of three states, as attorneys in the NY/NJ/CT area or the DC/MD/VA area might be, you have to worry about differing advertising regulations in three jurisdictions. Kelley Spradley, VP of Marketing & Sales at Impirus Legal Websites wrote an insightful guest blog post on MyShingle.com that delves further into this issue. If state regulations cover attorney websites as advertisements, how long will it take before they start policing Facebook pages or SEM campaigns? Have any states started doing this? We'd love to hear from readers. We've listened to a lot of customer feedback and are in the process of developing a new product - a twist on our current offering - that will pique the interest of small businesses and SEM professionals alike. In an era of performance-based marketing, it is important that we price our products in a competitive manner that makes sense to everyone. I won't spill the beans just yet because we are limiting our initial customer base while we perfect the system. On the SEM front, we're confident our product will be a hit with small businesses, SEM shops like OrangeSoda that serve them, and niche shops like LegalSEM that operate in the legal marketing sphere. Please reach out to us via email if you would like to learn more and participate in our beta trial. Twitter has begun to test what they call the "Twitter Business Center." Currently, it is only available to a few users, but Twitter will gradually roll it out to all accounts. Maybe the biggest caveat is that businesses can receive direct messages from anyone on the service, even from users they do not follow! This allows for a much more free flow of communication between businesses and potential customers. Once activated, a business' account is automatically verified. This signals a move by Twitter to offer certain aspects of the platform to brands and organizations, not just individual users. Interesting to note is the "Contributors" tab, which gives organizations the ability to add multiple users to a certain business account so that they have the ability to tweet on its behalf. The ability to accept direct messages from any follower, even those they are not following, allows organizations to better engage. Businesses can elicit feedback from any follower as well as perform customer service more easily. In addition, with the introduction of the "contributors" tab, businesses can now have several employees tweeting on behalf of the organization - this gives the organization a greater deal of versatility and flexibility.It will be interesting to see how this impacts businesses as Twitter begins to roll out its Business Center to more and more accounts. It is definitely a sign that Twitter is making the push to become a more viable business platform, one which businesses should utilize to their advantage! Blogs and Twitter can be a great way for your small business to increase leads. According to HubSpot, inbound marketing has the potential to bring more leads for less money. Small and medium-sized business have the opportunity to level the playing field with some of the big guys by strengthening their online presence. The focal point of social media is engagement and by regularly adding blog posts and content on Twitter, you can do just that. Another value add of frequent blogging and tweeting is that it can boost rankings on search engines such as Google. By having a more visible presence online and engaging the community comes the potential to increase your customer base. So Why Tweet & Blog? Engagement. Both Tweeting and Blogging provide an excellent means to become engaged online. Build search engine presence. More blog content means more pages indexed on major search engines like Google. The more pages your organization has, the better the odds of someone coming across your business. And with search engines now including real-time results, tweeting can give you another opportunity to increase your online presence. Lead generation. The numbers don't lie, SMBs who are tweeting and blogging are generating more leads, some cases nearly double the amount. As you can see, those SMBs that were using Twitter had nearly twice as many monthly leads as those who were not using Twitter. If used correctly, Twitter can be a vital tool in lead generation. Twitter can be great for highlighting services and products your business offers, relevant articles to your industry and simple, engaging conversation. With that being said, it can be just the tool your business needs to compliment your marketing and drive potential leads to your business. According to eMarketer, companies with 100-500 followers on Twitter generated 146% more median monthly leads than those with 21 to 100 followers. Beyond the 500 mark, there was no further gain. It is quality and not quantity when it comes to Twitter followers, so seek to create a loyal and engaged following. Furthermore, Tweeting can be another means of spreading the word about your business by growing search engine presence, Google for example, as they now pick up real-time results. In addition, blogging also has been found to increase monthly median leads. Companies who blog regularly were found to have nearly double the amount of monthly leads than those who did not blog. A key factor to remember is that blog content must be added regularly in order to keep visitors engaged and coming back to your site. Frequent, pertinent blog content demonstrates credibility and can allow you to position your organization as a valuable resource. People buy from people they trust, so start by being a trusted resource. Blogs are a great means to be engaged as well as an outstanding way to increase brand awareness. Regular blog content can help companies increase the number of pages they have indexed by major search engines such as Google and Bing. The more you blog, the greater the opportunity for someone to come across your company. According to HubSpot, organizations that have more pages indexed on Google tended to generate more leads. Is your small business tweeting and blogging? If not, start ASAP! Google Launches a Small Business Toolbox: "Tools for Online Success"
Google has long been interested in further engaging small business owners and took another step by introducing a new web page: "Tools for Online Success." The new site offers tips and advice on how to be successful online, and word on the street is that is has the support of the U.S. government as well (the U.S. Small Business Administration). Both the Google logo and the U.S. Small Business Administration logo appear on the page. Again, you can see the partnership between Google and the Small Business Administration at the top of the page. Each tab will have a video of a small business owner offering advice on how they used the internet to help their business. Though not a direct sell by Google, they hope to get more small business owners on board with Google tools by introducing this new online toolbox. How can a small business owner benefit? The opportunity to learn online marketing best practices from other small business owners could be extremely helpful in growing your business...plus it comes at a great price: free! The variety of topics that the toolbox covers offers a solid look at many of the key tactics in being successful with online marketing. Everyone is now online so the need to have effective online marketing is greater than ever for small businesses looking to level the playing field. The Internet can provide the stage to compete with some of the big players if the small business owner knows how to use online marketing tools to their advantage. The new online marketing toolbox is a win for small business owners, so check it out. You never know what you could learn that takes your small business to the next level! Sometimes overlooked by Facebook and Twitter, LinkedIn is one of the most powerful marketing tools that your business could use. It is the number one professional networking site and growing its user base each day, making it the ideal place to market your business. Creating a group gives your business the opportunity to identify a great number of potential leads by engaging with key influencers. The key is to be effective as possible when creating a group in order to maximize results for your organization. You want people to be able to find your small business online easily, so picking the right keywords is essential. Choose pertinent keywords in order to help your organization's search result rank on both LinkedIn's internal search as well as on Google. The easier you make it for people to find you, the more people will engage with you! Synergy is essential when it comes to social media, so be sure to include relevant links to blogs, websites, and other company pages to the group. If done correctly, these groups can play a huge role in lead generation for your organization. Engage the community - and what better way to do that then by asking relevant questions. Asking questions will allow you to connect with other experts in the field and share knowledge and ideas. Be sure to set up the "Answers Applications" on the bottom of your home page. If there is a question that relates to your small business field/industry/expertise, be sure to offer your thoughts. But also be sure to go a step further, don't offer tips but share links, blogs, articles, whatever it may be that might further answer the question. If you take the time to genuinely respond and help others, they will do the same in return! Asking stimulating and relevant questions, as well as offering advice, tips, and best practices can help you develop trust and credibility...both crucial to small business success! Events are a great way to engage the online community. LinkedIn has its own event platform which makes it easy for you to set up an event. The beauty in LinkedIn events is that when someone RSVPs, it shows up on the profile page of everyone that person is connected to...talk about viral marketing! The Advanced Search function can help your business target the exact audience you are looking for. At the top of the right side of your home page, click "Advanced." 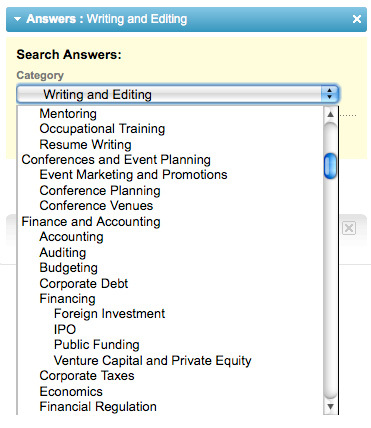 You can search by a ton of different categories, for example, industry, keywords, company, etc. LinkedIn should be a vital part of your marketing campaign. Other outlets such as Facebook, Twitter and Foursquare are great but the versatility of LinkedIn can do wonders for your business. Try one of all of these suggestions to enhance your marketing on LinkedIn. You just might be surprised at what they do for your lead generation! Recent news is that Facebook has new location-based features in the works to be unveiled in the immediate future – might be very soon, so keep an eye out! The location-features will be similar to that of social media outlets such as Foursquare, Brightkite and Gowalla – talk about direct competition. Facebook will allow users to check in at various locations, for example restaurants and coffee shops. It was only a matter of time before Facebook jumped on board the geo-location bandwagon. With Facebook adding location-based features, this adds another avenue for small businesses to engage and attract customers. The immense amount of users on Facebook presents a huge pool of potential customers that small businesses could tap into via the location-services. Moreover, there are significant advertising opportunities to be had by the new features. Potential customers could be targeted both geographically and demographically. Location-based services create opportunities to really hone in to local markets. It will be interesting to see the impact of these new features. With a big time player such as Facebook jumping into the location game, things are sure to heat up!